The story of Fox Cove is an example of a trend across South King County, where once affordable rental units, especially those close to Seattle, are disappearing. The problems at Fox Cove Apartments in Burien were many, from black mold in the walls to a door that had fallen off its hinges and took weeks to repair. One tenant had mushrooms growing up from her bathroom floor. The tenants said they complained but still put up with the endless fix-it list for a simple reason: They couldn’t afford to live anywhere else. Then, the first notices to vacate arrived. In mid-September, a developer bought the 36-unit apartment complex in south Burien, just west of Highway 509 and an easy shot to Sea-Tac Airport. Burien officials believe the company plans to remodel the property and lease the units for more than the current rents, though an attorney for the new owner has only said their goal is to turn the property around. But with the remodeling, all the residents were told to move, some by the end of October. 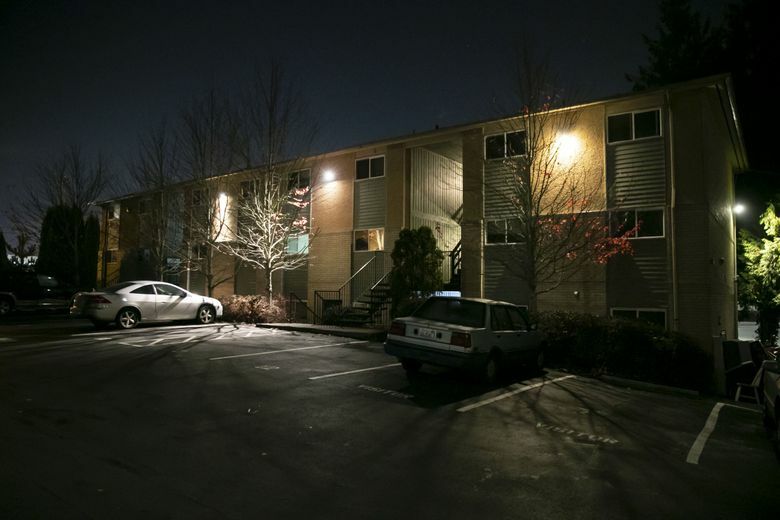 The story of Fox Cove is an example of a trend across South King County, where once affordable rental units, especially those close to Seattle, are disappearing. Developers see opportunities to revamp old apartments in these outlying cities. In the process, they are pushing out residents who have lived there for years. Soon after news of Fox Cove started to spread, Burien City Council member Krystal Marx started getting emails about other residents in similar situations. “I think Fox Cove is kind of the canary in a coal mine,” said Marx, who herself experienced homelessness as a child. The Fox Cove sale set in motion a large-scale effort by residents to secure help from the city of Burien. As of last week, the city reported 22 of the families at Fox Cove had housing or were in the process of getting housing. But getting financial help is only part of the solution. Many tenants had bad credit, spotty rental histories or criminal records that made securing an apartment challenging. Some had been homeless before. The previous Fox Cove landlords were willing to look past that in an increasingly expensive market. With the new ownership, tenants can reapply to live there, but many interviewed don’t expect they could afford the new rents anyway. One Fox Cove resident said she pays $965 a month for her two-bedroom unit. The latest median list rent in Burien for a two-bedroom is $1,575, according to Zillow. That means less and less housing stock for working people in places once flush with it. The King County Regional Affordable Housing Task Force estimates 3,600 affordable units are lost annually throughout the county. In Burien, rents for a two-bedroom unit were up 5.4 percent between October this year and last. “I have a feeling this is just kind of the tip of the iceberg for us,” Marx said. Burien city officials said they first learned of the sale and previous problems at Fox Cove on Sept. 28, when a group of residents showed up at a council meeting. Last month, City Attorney Lisa Marshall sent a letter to Christopher Benis, attorney for the new property-management company and owner, asking them to consider giving residents until the end of the year to move, particularly because relocation costs could total $4,000 per household, including security deposits and first and last month’s rent. The owner agreed to give residents more time, up to 90 days in some cases, but refused to cover relocation costs. That would in essence be “giving money away,” Benis said. Legally, the owners are within their rights. Seattle has some tenant protections, which can result in financial help for low-income tenants, but smaller cities like Burien often don’t. Fox Cove residents were on month-to-month leases. That gives landlords an easy way to push residents out quickly, said Edmund Witter, managing attorney for the Housing Justice Project, which is working with some of the Fox Cove tenants. A call and email to SUHRCO, the new property-management company, were not returned. The new property owner is listed as Fox Cove LLC, which is registered to a Joseph Strobele, according to the Washington Secretary of State. Another company registered to Strobele, Crystal Peaks LLC, says on its website that Strobele is most well known for developing the Escala in downtown Seattle, the high-rise condominium featured in the “50 Shades of Gray” series. Strobele also could not be reached for comment. In late October, the Burien City Council allocated about $9,000 in direct financial assistance to the families. The city also paid about $27,000 to help them find housing, some of which paid for a half-time program manager from the nonprofit Multi-Service Center, who has been working closely with residents to help them find housing. The Housing Justice Project also asked the city to send an inspector to the property to document some of the building problems. A state law requires landlords to pay relocation fees if it can be proved they were aware of serious code violations. But the City Council declined, on the city attorney’s advice, arguing the current owner would not be liable for damage. Also, if the city determined the complex had to be condemned, residents would have to vacate in 72 hours. Burien city officials have said they were unaware of the many problems at Fox Cove. No code-compliance violations have been filed against the property in at least the last five years, the city said. Even with help from the city, residents have had to make hard choices. Whitney and his family moved into a new apartment in Kent in mid-November but still had to pay all of this month’s rent at Fox Cove. Their new rent will run $600 higher, he said. Fox Cove resident Jaykayy, who asked not to use her last name for fear she might be targeted, didn’t pay October or November’s rent at the complex, feeling she had to make a decision between that and saving for a new apartment. (Several other residents also stopped paying rent, the city said). As a result, the new owner gave her a three-day notice to vacate last month. But she remained there with her husband and four young children for weeks, after the Housing Justice Project helped broker an extension through Nov. 15. “I’ve been dragging, because this is so depressing,” Jaykayy said. She was still looking for apartments, with help from the Multi-Service Center. But time was running out, so the family began staying nights at the new Mary’s Place shelter in Burien. She’d been homeless before, living with her entire family in a motel in Des Moines for two years until moving into Fox Cove. Now, the family had to adhere to the many shelter rules, like a nightly curfew or an inability to access sleeping areas during the day. “I do not want to go that place, y’all,” she said. Her younger children didn’t really understand what was happening, but her oldest daughter did. She got into a fight with two girls at school, who were complaining about moving into a house smaller than their current one. After about a week in Mary’s Place, the family was set to get a reprieve. With help from the city, they planned to move into a new apartment in Normandy Park, a few minutes away. City Council is now developing a series of tenant protections, not only to protect future renters but also because the help the city provided Fox Cove residents isn’t sustainable in the long-term, said Colleen Brandt-Schluter, Burien’s human services manager. Those protections will be too late for Fox Cove residents. Witter, with the Housing Justice Project, fears this is a scenario likely to repeat itself in South King County. Correction: A previous version of this story misstated how much time tenants had before they had to move. Editor’s note: Due to the number of comments on this story that violated our Terms of Service, the comment thread has been removed. Vianna Davila: 206-652-6550 or vdavila@seattletimes.com; on Twitter: @ViannaDavila.